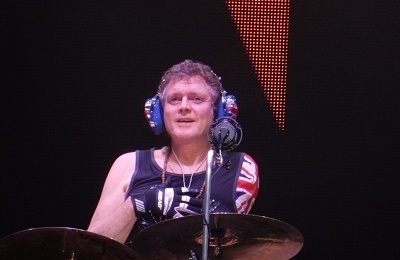 Rick Allen has suggested Def Leppard will have to postpone all upcoming tour dates due to Joe Elliott's illness. 13 shows with Styx and Tesla were announced in October 2015 for January and February. The first of these in Greensboro, NC was postponed earlier this week. Last night's show in Orlando, FL was postponed at the last minute only four or five hours before show time. Only one in Sunrise, FL went ahead but didn't exactly go well (from Joe's perspective) with Jeff Keith from Tesla stepping in at the end to basically take over lead vocals for the encore songs. Rick Allen has now said (in a somewhat random tweet) Joe will have to miss all upcoming shows and therefore the band will have to postpone all February dates. the band and the venues have not released any statement about this as yet. They probably will either later today or early Monday morning. Joe began to suffer vocal issues during the Hysteria On The High Seas cruise. This affected the Storytellers acoustic concert on the 22nd and also meant he had to sit out the electric concert on the 23rd. Last night a fan at the Orlando Meet And Greet said they were told Joe would have to rest for a month - this was believed to possibly be speculation but it turns out to be true. This will leave the next scheduled show as Orlando, FL on 1st May. The one off festival date. This gives Joe three months to get ready for that show and the upcoming summer tour which he has said will start in June. Joe ended the 2015 US tour with illness but recovered before the start of the Japanese tour. "The Doctor basically said that if Joe continues to sing without resting his throat for a month he might do permanent damage." The Doctor basically said that if Joe continues to sing without resting his throat for a month he might do permanent damage..